Usambara Double-collared Sunbirds are endemic to the high elevation forests of four small mountain blocks in northeast Tanzania and southeastern Kenya: the Taita Hills, the South Pare, and the East and West Usambara. This photograph shows a male near the village of Mazumbai in the West Usambara. Male Usambara Double-collared Sunbirds display this stunningly colorful plumage year-round, in contrast with the always dull-colored females. These sunbirds also exhibit amazingly diverse vocal repertoires. 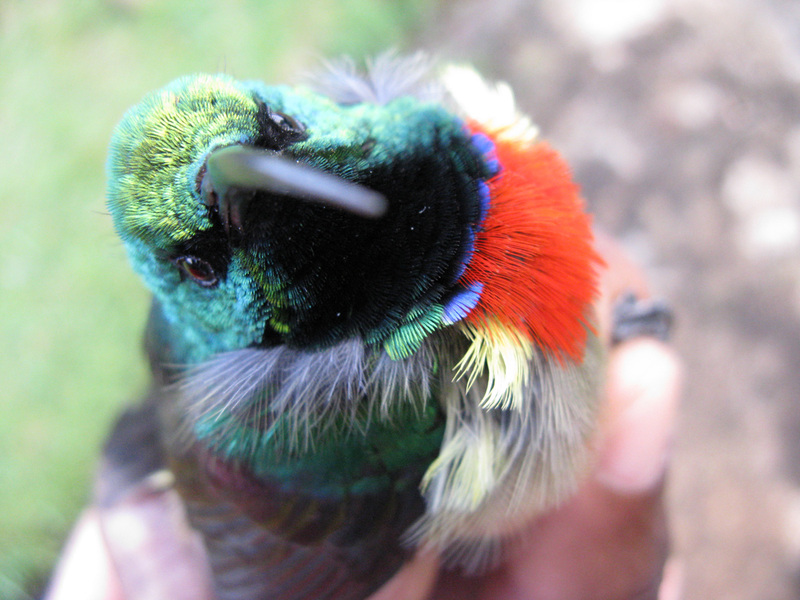 Jay McEntee, a former graduate student in the Integrative Biology department and the Museum of Vertebrate Zoology, studied vocal evolution and speciation in the group of sunbirds that contains the Usambara Double-collared Sunbird.